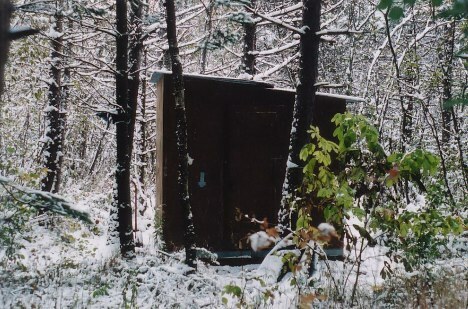 In the fall of 2002, I had the pleasure of working for the Hawk Ridge Nature Reserve located on the ridge above Duluth, Minnesota. I served as the primary owl bander at this key migration spot. 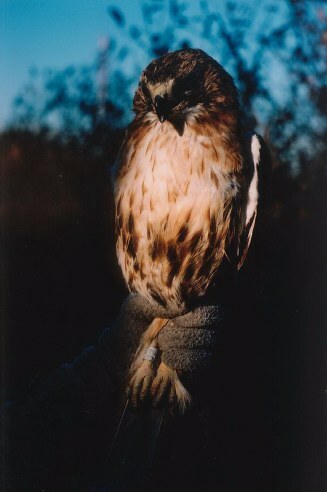 I also assisted in the trapping of hawks on the ridge. You will notice that none of the photos below are owls and I have to apologize for this. 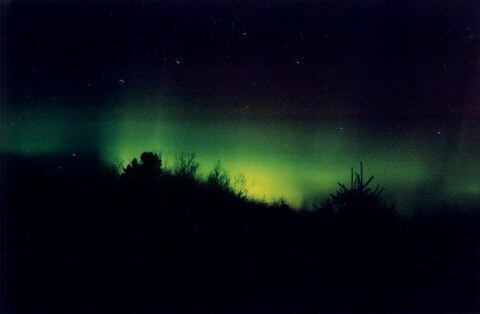 My camera's flash broke just before leaving for Duluth. I am hoping that next year when I return to Hawk Ridge, I will be able to photograph more owls. 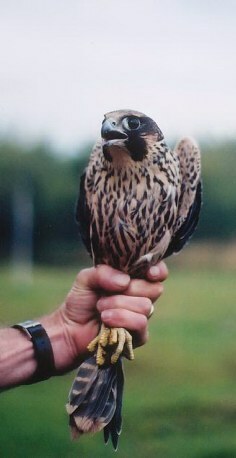 The funneling effect of Lake Superior brings large numbers of migrant raptors through the Duluth area each fall. 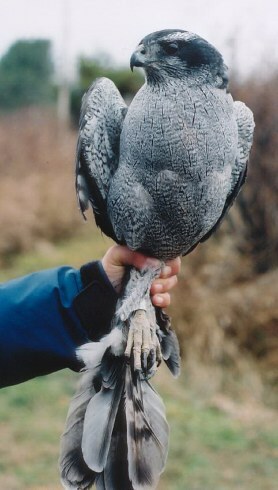 Many of the more boreal species such as Northern Goshawks follow the boreal forest which extends for thousands of mile to the northwest. In this way birds from the thousands of square mile of boreal forests of Canada and Alaska are funneled through a very small point. One of the great advantages of spending the whole night awake plucking owls from mist-nets is the fantastic northern lights (aurora borealis) shows. We use a circular system of strings in which bait birds (pigeons, doves, starlings, and sparrows) are attached to the lines with harnesses. When a bird of prey is spotted the bait birds are then pulled into the air by pulling on the strings. This attracts the attention of the raptor. 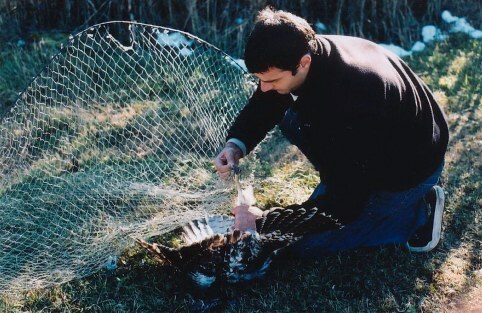 The bird of prey is then either trapped in a mist-net or the bait bird is dragged to a bow net where we trigger it and the hawk is trapped more or less manually. 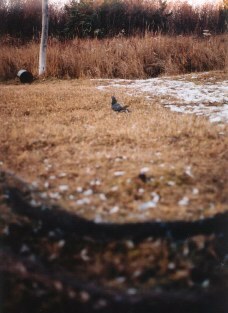 Above to the left you can see a Rock Dove and the bow net set-up. To the right you can see a Red-tailed Hawk being extracted from a bow net. Below you can see where we keep some of our bait birds. 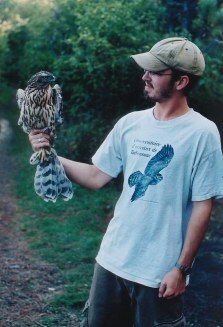 Recapturing birds is what banding is all about. 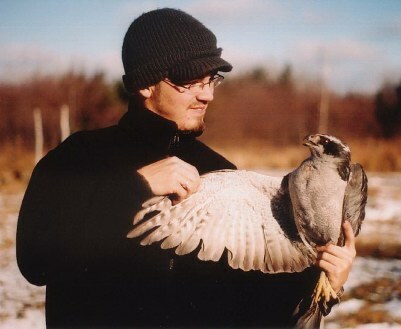 Recapture rates are much higher on raptors than in passerines. To the left you can see a 12+ year old Northern Goshawk that was banded 12 years ago as an "after second year" (ASY) bird. 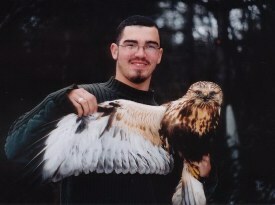 The Red-tailed Hawk to the right was banded as a "hatch year" (HY or immature) in 1980!!! That makes it a 21 year old Red-tail! 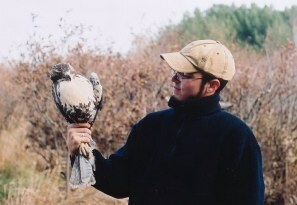 This is the first Red-tailed to be recaptured at Hawk Ridge in its 30 year existence. 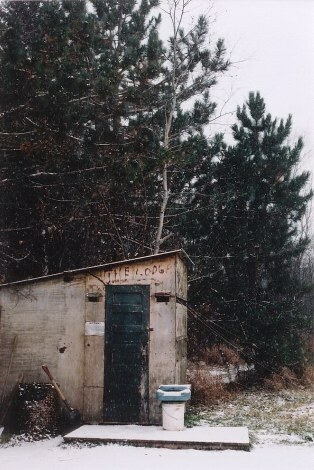 The "Lodge" pictured above is our banding station, blind, kitchen (Coleman stove - also used as heater on those cold night), family room, and dining room. It is heated by propane and is a home away from home. Below is the "Shack or Hacienda", our sleeping quarters. It is about 10' x 12' and sleeps three people on bunk beds. 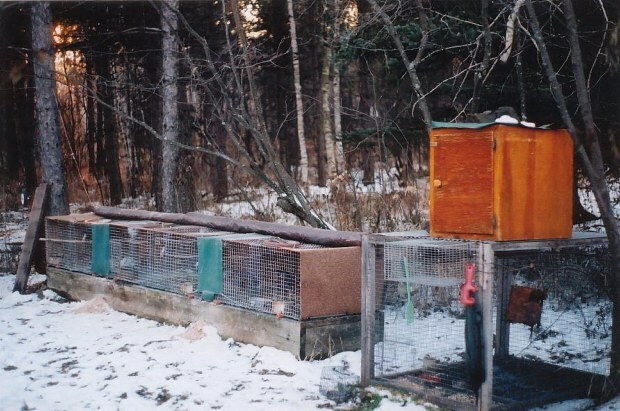 It is heated by a wonderfully big propane heater, which makes for wonderful sleeping on those single digit degree nights and days (for the owl bander). It is a little drafty because all the structures on Hawk Ridge are designed to be collapsible and mobile and the resident black bear decided to tear a hole in it as well. We don't always catch birds in our nets. 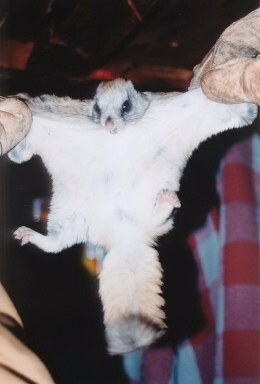 This Northern Flying-Squirrel ( Glaucomys sabrinus ) was captured one night late in the season. These nocturnal squirrels are very destructive to mist nets and can be a nuisance. This fall we also captured the following bat species: E. Pipistrel (Duluth is the northern edge of this species range), Big Brown Bat (this bat was captured in mid-Nov. it as 30 degrees Fahrenheit), Silver-haired Bat, and Hoary Bat.